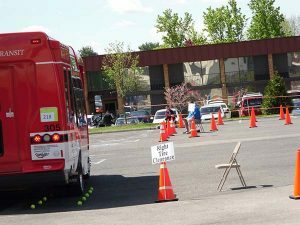 On March 24-26, 2015, Bay Aging/Bay Transit will provide a dynamic training and competition called the “Bay Transit Roadeo” at the Warsaw Transit Facility in Warsaw, VA (111 Commerce Parkway) from 8:30 AM to 4:30 PM each day. Safety is Bay Transit’s number one goal. Comprehensive Driver training insures that passengers of all ages being transported to work, appointments, shopping or other errands are secure and comfortable. The highlight of Bay Transit’s training program is the Annual Roadeo. This event tests the skills and abilities of every Bay Transit Driver throughout the Northern Neck and Middle Peninsula. Each Driver is required to complete specific tasks critical to safe transportation and follow industry standards and practices as outlined by the Community Transportation Association of America. Written Exam – Questions focusing on safety, traffic law, transportation of passengers with disabilities, and customer service. Scores are kept from each activity and the top three Drivers with the highest scores automatically qualify for the State Roadeo to be held in Harrisonburg, VA on April 11, 2015. And if a Driver from Bay Transit wins that event, he or she will travel to Tampa, FL on May 31, 2015. Even as this Roadeo is a challenging event, it also provides an opportunity for fun and fellowship among Drivers throughout the region that rarely see each other. Citizens and residents may come and observe the Roadeo and watch their Driver’s in action as they compete with fun and professionalism! Scene from last years State Rodeo. Winners from the Bay Aging Rodeo attend the State Rodeo. Come to cheer your drivers on!